Football is the most popular game in the world, played constantly everywhere across the planet. The World Cup, where international football teams compete to be the best, is one of the biggest sporting occasions in the world. Yet did you know that Scotland was where the first official international football match was played? International football began in Glasgow. On 30th of November 1972, Scotland played England at Hamilton Crescent in the Partick area of the city. 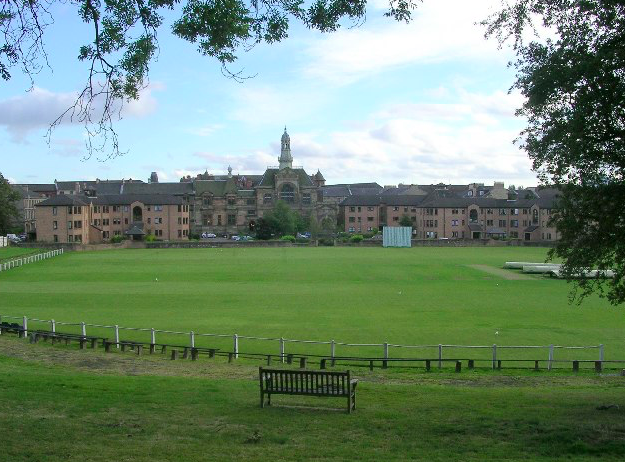 This wasn’t a football ground: it was actually West of Scotland Cricket Club’s pitch! It is shown in the picture here and you can still go and see it today as it’s still used for cricket. All eleven Scottish players came from Queen’s Park, who were at that time the best club side in Scotland. The English side was selected form nine different clubs. Around 4,000 spectators attended, paying one shilling (5 pence) each to do so. Scotland had a goal disallowed in the first half when the umpires (there were not modern referees in those days) decided it had gone over the tape that was stretched between the posts (the crossbar that we know today wasn’t invented yet!). When the game ended, the score was 0-0, and international football, as we know it today, had been born.